The question many servicing companies ask nowadays isn’t whether field service applications and software are important for the smooth running of their business. In fact, many of them are already coming to terms with reality and accepting that these apps and software have transformed the way they do business more than ever before. The question many pest control company owners now ask is which pest control mobile app has all the features that will make running their business more effective at a very affordable price. The answer to that question isn’t farfetched at all. Fieldsurf is the software to go for if you are gunning for affordability and effectiveness in a single software. FieldSurf’s pest control mobile app is the all-in-one tool you need to rejuvenate your business and set things on the right path. And the beauty of it all is that it comes at a very cheap price. In fact, FieldSurf is the most affordable field service management you will find out there, yet it comes with a lot of extra features you will hardly find in others. In addition to being able to organize and deliver total control of your business to you, all the unique features of this pest control mobile app will turn your business around and set your company on the path towards greater business success. The effectiveness of this software is astonishing and many business owners in the pest control industry even find it hard to believe it’s even possible for one software to do all that FieldSurf promises until they’ve tested the software themselves. It seamlessly integrates all the tiny details of a typical day in your company into a simple dashboard. Every detail of regular tasks like dispatching calls and scheduling orders, creating invoices and sending them and the less regular but extensive details like preparing workers payroll and accounting reports as well as the seemingly irrelevant things like clocking in your field and office staff. With Fieldsurf you can control it all and do business more effectively. What’s scheduling and dispatching like without FieldSurf? If you ask your dispatch and scheduling staff they will tell you how difficult it is to keep track of every call that comes in, organize each of these calls and disseminate the information to the field technicians that will handle the job. They need to be able to tell whether the caller is a new customer requesting your services while still keeping track of your regular scheduled pest control services and dispatch technicians to the site without clashes or errors. Asides the risk of double booking a field technician, there is also a question of finding the right team positioned for the job when all your teams are on the field especially if the task at hand is an urgent call for your services. But give your dispatch staff FieldSurf’s pest control mobile app and software & see how effective they work. They no longer have to worry about how to keep track of every call that comes in. FieldSurf helps them do all that and even keep a record of all the needed information. When it comes to communication between your desk staff and pest control experts in the field, the process is not just simple, but also easy. An SMS interface allows them to notify the team within suitable range of the task which they are able to identify using FieldSurf’s GPS function and dispatch them appropriately to location without delay. SMS is received in real time and the team knows exactly where to go. Errors are minimized in the system by keeping two separate calendars, one for routine tasks and the other for new orders. That way even if by human errors your dispatch staff tries to book an already booked technician for a new task, he is unable to and he has to reschedule or pick another technician for the job. The Geofencing feature allows you to set up virtual boundaries that earmark the particular geographical area where your business covers. FieldSurf’s geofencing option is the way to stay up to date with all your staff’s GPS location at all times during the day. It’s a great addition your dispatch team will find handy for business and also for any member of your administrative staff that wants to take a look at everyone or anyone within your set up perimeter. 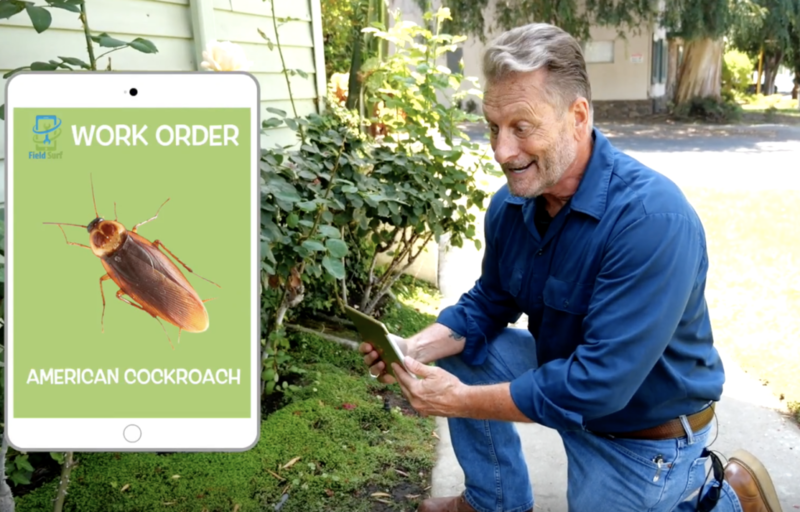 So you have a team of pest control experts that always get the job done, you can make them even more effective when you equip them with our pest control mobile app. With this application, your field staff always clock in when they arrive at a job and clock out when they leave with Fieldsurf so that you always know where they are and also know the status of every task. You can even make your field technicians do more than just get rid of pests, they can double as your sales agent too – helping you process payments in the field. When they finish a job, the client simply needs to sign on their smartphone with a stylus. This automatically tells your office to send them an invoice which has been prepared at the point of receiving the other automatically and the client is a mailed an invoice on the spot. You can even take things a step further and have your technician’s process payments for you on the field. It’s almost instant and saves you a lot of time on paperwork and time wasted waiting for your client to get back to you after an invoice has been sent to them. The card swipe option makes your customer make payment in an instant by swiping their card. Your technician’s smartphone or by proving their credit card details. Accounting is one aspect of doing business that many companies have always used software to handle. FieldSurf goes beyond equipping your accounting team to deliver accurate accounting, instead, it allows you to access your company’s financial status at any instant without having to wait for a team to put anything together. It is straightforward financial accounting devoid of any form of paperwork and understandable to anyone. FieldSurf analytics tool also allows you to read, interpret and make a well-informed comparison in the business report provided to you. You can make a comparison between the specific sales periods, find out how much your company is making within a specific sales period among other business analytic tools which FieldSurf gives you access to. Having all this information allows you to plan and strategize better for coming days. Having this pest control mobile app in the palm of your hand, truly is a game changer. FieldSurf also makes the process of preparing your payroll surprisingly easy. You no longer need so much paperwork to get your staff payment processed. FieldSurf allows you to prepare the payroll for your workers for a specific pay period. In addition to this, you can also access how much a worker has earned even before a payment period elapses including the bonuses and commissions they have earned. It’s real-time information and you don’t have to wait endlessly for a report from your accounting team. FieldSurf manages inventory better than any other software does. Again it eliminates all forms of paperwork or need to manually input data into the application. Simply scan the barcode on every item in your store and take an image of the product and FieldSurf keeps a record of it instantly. Every product taken out by any technician is recorded on your pest control mobile app and software. So that you not only know when items in your store are exhausted but you can account for how each item was used and who took an item out of the store. There are a lot of benefits FieldSurf has to offer your business, but above all, you will be surprised at how affordable this pest control mobile app truly is. It’s easy to download and totally easy to use. Many servicing companies including those in the pest control industry can testify to how FieldSurf is helping their customer retention and sales. By improving how they do business, they are able to satisfy their customers more, work faster and make more profits in the long run. To learn more about how FieldSurf’s amazing features can make your Pest Control business better you can schedule a free demo below.